We have in Ponteland a dedicated building for youth work, in the grounds of the schools on Callerton Lane, and a dedicated leader of a team of paid and volunteer workers who are bringing out the best in our young people. Angus Ramlal was appointed last year and comes with a fine record of youth work since he came to the northeast in 2000 and worked at Whitley Bay with disadvantaged children. Now in Ponteland he is happy to work in a place with a strong community feel and help the young ones to develop their skills and contribute to their neighbourhood. There are a number of voluntary projects that use the abilities of willing youngsters. At present there are links with the Lions’ club, voluntary work through the Duke of Edinburgh award and Angus is exploring a tie-up with English Heritage. The possibilities are endless but here are a few of the things they do now - football and golf sessions, mountain biking, Girls Allowed, healthy eating and nutrition. The programme constantly changes and is adapted to the needs and interests of the young people. Angus is a big man in every way, both physically and with the ideas and enthusiasm he has brought to Ponteland. He was brought up by his parents in Hackney London where they settled after leaving Trinidad in the sixties. University in Manchester brought him north but it is the north east he loves, the coast where he lives, the countryside and of course, the people. If only the summers could last more than a couple of weeks! One of the young people in Ponteland is about to finish his course at Kirkley Hall College and work on his business full time. 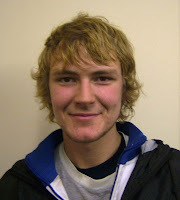 Shaun Nichol has done a course in arboriculture but has been working for himself since he was fourteen. But Shaun has also given his time to the provision of a skate park in Ponteland where he has helped in fund-raising, attended meetings and visited other similar facilities – all the boring behind the scenes work. The goal is now in sight. He has used his skills in the Park in the preparation of the meadow and helping the young school children to plant bulbs. The Lions’ Club were pleased to promote Shaun for their Young Ambassador award. 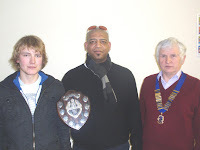 He was the District winner and went to the finals in Dudley in the midlands, up against another thirteen young people. All of this is valuable experience for a shy but very capable young man.